Graduation day from the 90 day plan doesn’t unfortunately come to us all and as the weeks progress and the cycles roll on, the numbers making it through dwindle but some of us make it to the end, albeit with gritted teeth! Graduation day no. 2 took place on 15th May 2017, but would it surprise you if I told you Day 1 was on 10th November 2016? 6 months and 5 days to be precise and it was certainly harder the second time around in my honest opinion. Q. Why did I decide to do the plan again? A. I was delighted with my results from the first round but I didn’t fancy going back to the set recipes in SAS (the graduate program) so after consulting with my support hero I took the decision to sign back up again. However SAS has now changed to pick and mix and if it was that way back then I would not have signed up again. Q. Did you pay for a new plan or did you just use your old plan? A. I wanted my progress to continue so I paid for a new plan. I needed to take the guess work out of the food side so it made sense to get a new plan for my new body shape. After all, if I was happy to guess as the food amounts I would have continued using the books. Q. Are you seeing the same level of results as the first round? A. I’ll come to that later! Q. Are you going for round 3? A. Hell no but not for the reasons you think. As I already touched upon, I started this round of the plan in November 2016. Why did it take me so long to finish? Well on New Years Eve I was doing C2 chest and back day weights and I remember feeling a pain in my shoulder. Instead of stopping I pushed on and over the next few days the pain was terrible. I rested, took pain killers and booked into see my Osteopath as soon as I could. I was told that I had to rest to recover from my injury and I was out of action for a month. While I did my best to stay low carb, at the weekends I did sneak in a carb meal as I’m not good at going no carbs for that amount of time. I went back to the Osteopath as I needed and when she gave me the all clear to get back to workouts, I decided to go back to C1 and start again. If you read my blog post ‘Round 2 – C1 Completed, an honest review’ you’ll see that I did T25 Beta which included some resistance training. This helped to retain the muscle tone I had gained from the first round of the plan. Because of my injury I decided to try the Insanity program. There’s no resistance work included so when I got to the end of C1 and checked my progress I was roughly where I was at the end of the C1 I had completed, but my scales showed that I had lost some muscle tone (I have some fancy scales!). We so looked forward to getting to C2 because we love the freedom of training day eating. When it came to my results I have to admit I wasn’t so happy. Previously in my first round I lost weight and inches on all 3 cycles. On this C2 I lost no weight and gained half an inch. Yes I was disappointed but then I thought back to all those posts on Facebook from people who posted similar results. We’d all pitch in with ‘remember C2 is a building cycle and C3 will help you shred fat and show off those lovely muscles you’ve been building. Trust the plan’. Having uttered that advice so many times to help others, it was time for me to take that advice myself. On reflection I’m not confident that I pushed myself hard enough in relation to the weight training because I didn’t want to injure myself again and I wanted to save something in the tank for C3. I remember really going for it on my very first C2, but perhaps now my body fat was different, it was behaving differently to the building cycle that is C2. BUT looking at my progress pictures I can see some small changes but nothing significant to alter the scales or move the tape measure. When we started C3 I got in touch with my support hero and told her how disappointed I was with my C2 results. I explained that I wanted this C3 to be the best it could be and wanted to give it everything so asked for her advice. She suggested I mixed up the hiit part of my workout so I alternated between a hiit on the cross trainer and my own hiit sessions. She also suggested that I needed to be pushing on the weights, upping the weights where I could and concentrating on my form so as to avoid injury. Thinking back to New Years Eve I do remember ploughing through the weights as it was New Years Eve after all. Week by week my weights across the different exercises went up. I was working out very early in the morning, but even then there’s a pressure to be done in time to be able to shower before the children wake up. We made the decision to move our workouts to the evenings so there were no time constraints. Our evenings were pretty structured on a training day. Feed, bath and put the children to sleep. Change into our workout gear, BCAA drink, workout, BCAA drink, protein shake, shower, dinner, TV for 30 mins to sit with the dogs and bed. It’s not what I call normal family life, but when we were with the children they had 100% of our attention. When they were in bed it was our time to workout, and thankfully I had company as Mr Burble and I train together. The first couple of weeks of C3 were hard. Getting used to 1 carb meal post training and the increased workouts, but if I’m honest I wasn’t as hard as my first C3. During the first round I was hungry, hangry and struggled with being tired. This time around I was none of those, but when I felt tired I rested and moved my training days around so that I could listen to what my body needed. I saw no sense in pushing through tiredness risking injury. Having started this round in November I wanted to get the end of the round before it hit it’s birthday! Two weeks into the cycle I began to see some changes. I was really and I mean REALLY strict with the food, and snacks. I drank as much water as I could and stayed away from any G&T’s or chocolate. I batch cooked a lot of meals to cut down on the prep time on training days and I even managed 2 lunches out with my mum when she visited but I made the best choices I could. The first lunch was at Zizzi. I chose a chicken salad but I think it contravened the Trade Descriptions Act because by the time I’d fished out ever single crouton there was barely any chicken in it! I didn’t think to order some prawns as a starter to try and get the right protein levels but never mind! The following day we went to Carluccio’s for lunch and I picked a chicken dish which came with potatoes. The waitress swapped the potatoes with green beans and I’m pretty sure mum had my share of spuds too. I suggested she had the green beans too but that wasn’t happening. While those 2 lunches were perhaps shy of protein or a little higher in fats that what I would make on plan I didn’t let that worry me. It was more important to spend time with my mum and I stayed away from the sweet stuff and worked out while she was here too. Am I happy with my results from this second round? Yes but I’m not where I want to be yet. I don’t have a weight goal nor a dress size goal, but seeing what the workouts have done to my body has given me the drive to keep on going and see where I can get to. I don’t have aspirations for abs and in the Burble gym I don’t set pb’s (personal bests), but I know that if I continue to work hard I can make further changes to my body. I look back that my start pictures and I honestly don’t recognise myself. A lot has changed both physically and emotionally. I used to be quite an anxious personality, I still feel a little anxiety when I’m tired but it doesn’t affect me like it did. My outlook on life is positive and I’m enjoying cooking again. 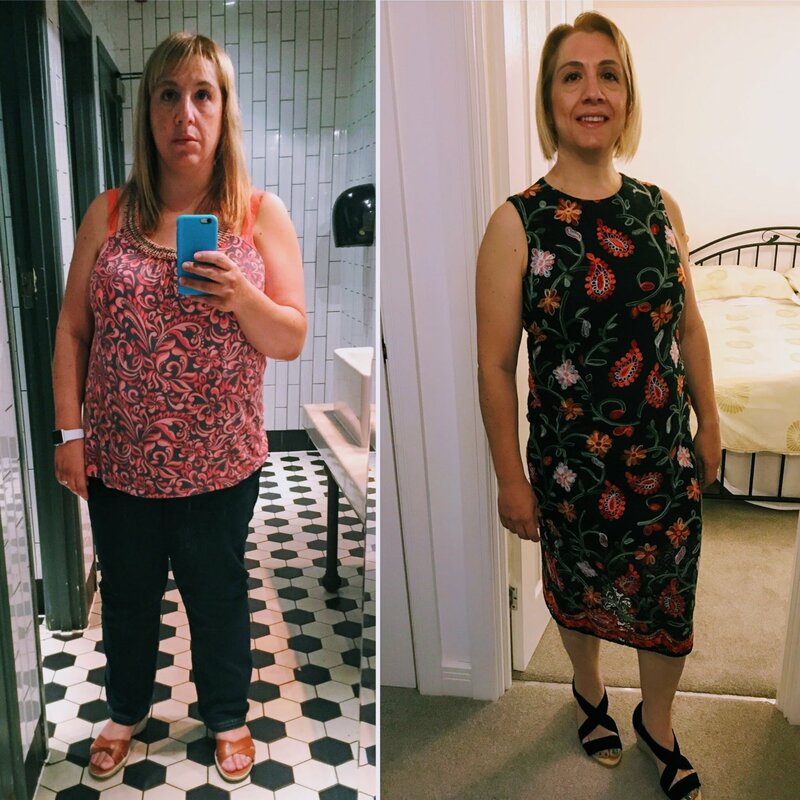 At the start of all of this I didn’t enjoy cooking because at the end of the day I was eating too much of the wrong things to lose weight successfully and I hadn’t considered exercising. Now I know how to put a healthy meal together and I still enjoy the odd treat without letting it derail my hard work. There are no shortcuts to what I’ve done. I’ve worked just as hard in the kitchen as I have in the Burble gym. The two go hand in hand and I’m not sure that I could have made it to the end of the plan if the food was ‘diet food’. What’s next? I’ve been on plan since July 2016 and in that time the last of the Lean in 15 books was published, so I’ve decided to take a few weeks out to cook some things from it, catch-up with some recipe writing and cook a few things that I’ve had my eye on! The workouts continue so that I don’t lose muscle mass and I will be signing up to SAS as I’m happy with pick and mix and I understand the workouts are interesting. Signing up for the 90 Day SSS plan was life changing for me and the fact that I’ve done it twice astounds me, but I don’t think a third round would yield much progress. SAS has now been updated with new recipes and pick and mix, so that’s me sorted until I get up and decide I’m finally where I want to be. I really appreciate all the messages of support on Facebook, Instagram and via email supporting me throughout my journey. The best is yet to come! Side effects, this may not surprise you!